What is a symbol? This is a tough question to answer when tasked with analyzing the earliest graphic productions. What we might today interpret as figurative representations might just be an ancient doodle that had no special purpose. For a long time, archaeologists were convinced the first symbols appeared when Homo sapiens colonized areas of Europe about 40,000 years ago. However, recent archaeological discoveries in Africa, Europe, and Asia suggest the creation and use of symbols emerged much earlier. For example, the oldest known engraving is a zigzag carved into the shell of a freshwater mussel found in Trinil (Java) within 540,000-year-old archaeological strata. And objects for personal adornment have been unearthed at several archaeological sites in Africa dating back to 70,000 to 120,000 years before the present. In the new article, the international team that includes scientists from the PACEA (CNRS / University of Bordeaux / French Ministry of Culture) and TRACES (CNRS / University of Toulouse-Jean Jaures / French Ministry of Culture) research units describe the oldest known abstract drawing made with a piece of ocher used as a pencil. It was identified on the surface of a small piece of siliceous rock (silcrete) while analyzing stone tools collected during an excavation at Blombos Cave in South Africa*. The silcrete fragment came from a 73,000-year-old archaeological stratum and bears a crosshatched pattern made up of nine fine lines. A major methodological challenge was to prove these lines were deliberately drawn by humans. It was primarily tackled by the team's French members, experts in these matters and specialized in the chemical analysis of pigments. First they reproduced the same lines using various techniques: They tried fragments of ocher with a point or an edge and also applied different aqueous dilutions of ocher powder using brushes. Using techniques of microscopic, chemical, and tribological** analysis, they then compared their drawings to the ancient original. Their findings confirm the lines were intentionally drawn with a pointed ocher implement on a surface first smoothed by rubbing. The pattern thus constitutes the earliest known drawing, preceding the oldest previously discovered works by at least 30,000 years. The archaeological stratum in which the silcrete flake lay had already yielded many other objects with symbolic markings, including ocher fragments that feature very similar crosshatched engraving. 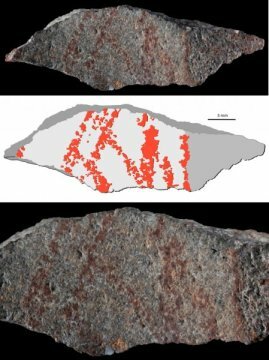 These finds demonstrate that the first Homo sapiens in this region of Africa used different techniques to produce similar signs on different materials, which supports the hypothesis that these markings served a symbolic function. * Blombos Cave is the site of an ongoing excavation by teams from the University of Bergen (Norway) and the University of Witwatersrand (South Africa) that begun in 1991. **. Tribology is the science of friction and wear.